No gun needed. Ends snap together easily by hand. 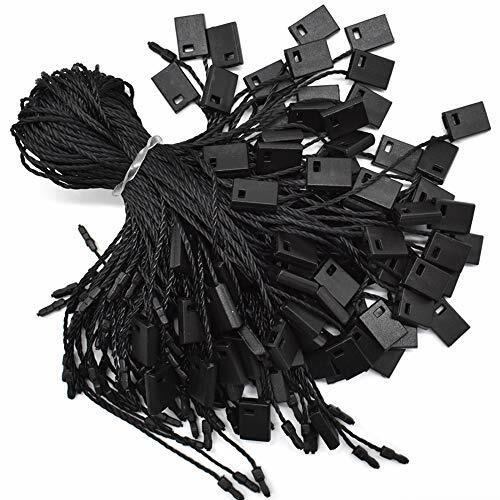 This is a lot of 600 Standard Black three inch (3") Tagging Fasteners for use in standard tagging guns...will not work with fine tagging guns. 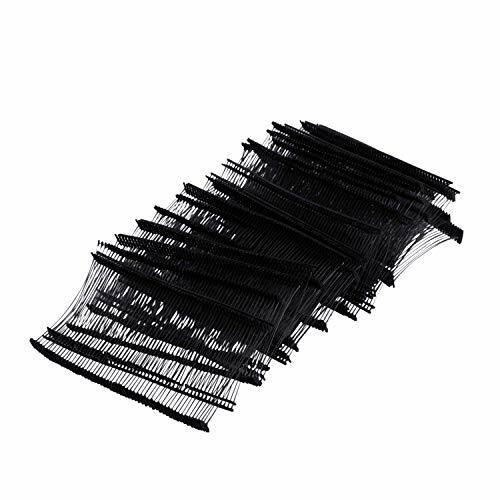 1000 Black Nylon Hang Tag Fasteners with Plastic Lockers. 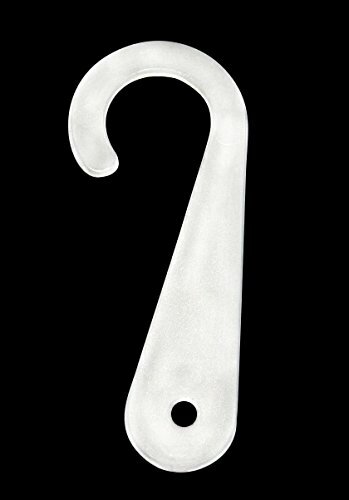 - Perfect Fastener choice for gift tag , hang tag , price tag. to attach tags to garment, purse, shoes, belt, luggage. - String locker mechanism make locking easily to save your time. - Toys luggage ,gift or any machine parts or where secured tags required. 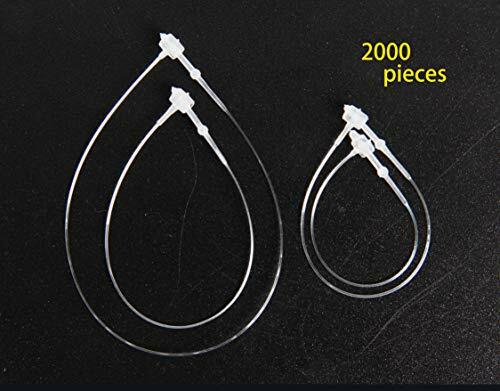 SIZE: Nylon String is 7 long (17.8 cm) and fits through grommet holes 1/8th inch in diameter and larger. Plastic locker is 0.3 (0.7 cm) wide and 0.4 (1 cm) long. Easy for assembly ,Black Nylon Tag String have Button Locker mechanism ,Just push it ,No tagging guns or other tools required. Great Use: You can attach swing tickets or tags to garment woven labels, clothing, purse, shoes, belts, toys, luggage, gift, any machine parts, where secured tags required, or any other parts. Perfect for boutiques, online sellers, gift tags, bookmarks, ornaments, crochet, knit clothing, or jewelry store & DIY . Used for attaching tags, brand labels and price labels to clothes etc. These are standard barbs and can be used in all of the most popular standard tagging guns...not for use in fine tagging guns. 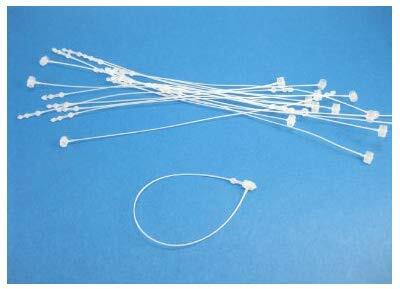 Amram 1 Standard Attachments-5,000pcs, 50/Clip. for use with All Amram Brand Standard Tagging Guns. Compatible for use with Other Standard Tagging Guns. 5000 pcs of premium quality 1 Inch standard tagging fasteners for use with most standard tagging guns including Comfort Grip, Hawk and Amram standard tagging guns. Clean cut taper cuts attachments cleanly and evenly- greatly reducing jammig and hand and wrist stress. Amram standard tagging attachments secure price tags to merchandise. Designed for use with standard types of fabrics including wool, linen, cotton, light denim, polyester and synthetics. 5000 pcs in a convenient storage box. Not for use with Fine tagging guns. For best best results, use with Amram tag attaching tagging guns and Amram replacement needles. Amram tagging products are a leading choice for retailers and manufacturers. Amram 1" Standard Attachments-5,000 pieces, 50/Clip. For use with all Amram Brand Standard Tagging Guns. Compatible for use with other Standard tagging guns. Compatible for use with Avery Dennison, Monarch, Garvey, Tach-It and other Standard Tagging Guns. Excellent Value! Use only with Standard tag attaching guns. Not for use with Fine Tagging Guns. Amram products are the choice of leading retailers. Looking for another size? 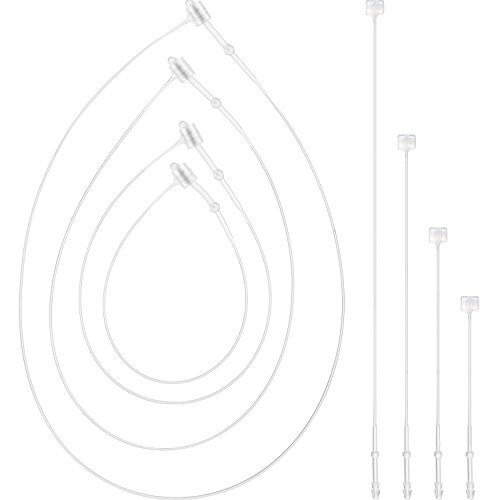 Amram standard attachments are available in 1/2, 1, 2 & 3 sizes, as well as J-Hook attachments. 1 is available in Natural, Black, Red, Yellow, Blue, Green, Orange, Grey, and Pink. 3 is available in Natural & Black. For a product solution that works best for you, please be sure to view all of our Amram product ASINs on Amazon. For best results, use with Amram tag attaching tagging guns and Amram replacement needles. Easy for assembly ,White Nylon Tag String have Button Locker mechanism ,Just push it ,No tagging guns or other tools required. 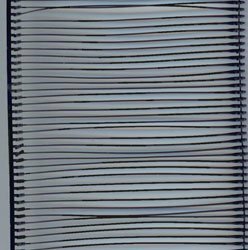 2000 pcs of premium quality 1 3/4 inch sock display hooks for use with most standard and fine tagging guns including Comfort Grip, Hawk and Amram standard tagging guns. 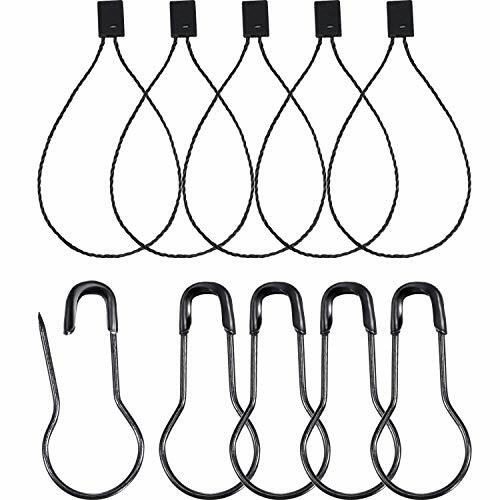 Amram sock hooks are used for hosiery pairing and bundling allowing for easy merchandising on retail racks and gondola hooks. 2000 pcs in a poly bag. Can be used with standard or fine tagging guns. For best best results, use with Amram tag attaching tagging guns and Amram replacement needles. Amram products are a leading choice for retailers and manufacturers. 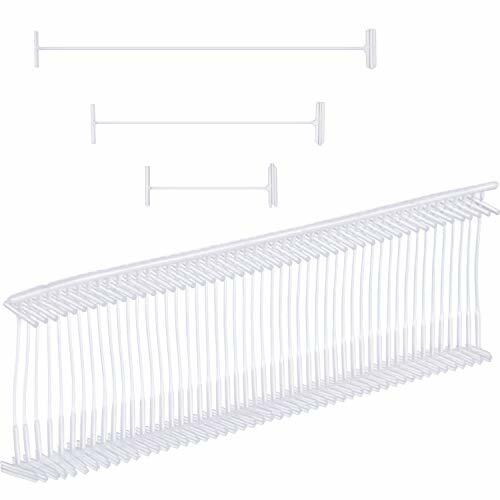 2000 pcs of premium quality 1 3/4 Inch sock display hooks for use with most standard and fine tagging guns including Comfort Grip, Hawk and Amram standard tagging guns. Amram sock hooks are used for hosiery pairing and bundling allowing for easy merchandising on retail racks and gondola hooks. 2000 pcs in a poly bag. Can be used with standard or fine tagging guns. For best best results, use with Amram tag attaching tagging guns and Amram replacement needles. Amram products are a leading choice for retailers and manufacturers. Put the labels on the tag and clothes, shoes and so on, and insert the round head into the round hole with your hands. It's very simple to use. The appearance is very delicate and has strong toughness. 3000 5 inch tag buttons can easily meet your needs, and the cost performance is very high. It is suitable for various bundles and attachment forms around families and offices. 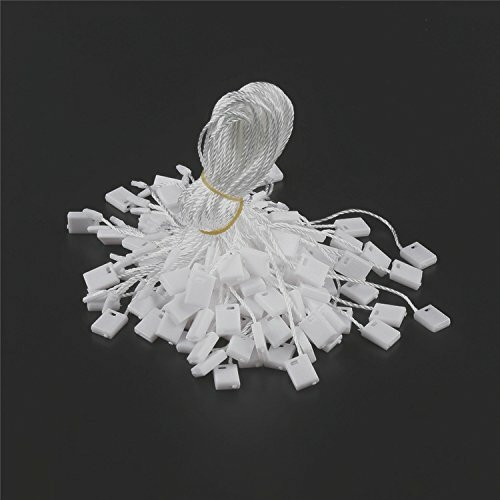 Very suitable for hanging lightweight Christmas decorations and decorations. Quantity: 3000 clear plastic fastener hang tag snap. Material PP Solid and durable in safety and environmental protection. Multipurpose:It can be used in clothing, shoes, socks, jewels, umbrellas and so on. QA:If the product is not satisfactory, you can contact us to refund or replace the goods. 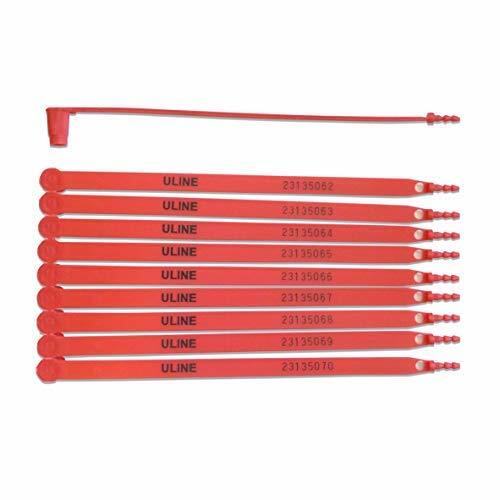 Plastic Truck Seals from Uline. The seals easily separate from each other, easily snap into place, and self-lock with a double-click locking mechanism for extra security. The polypropylene plastic material "blushes" to show evidence of tampering and the seals each feature a unique printed identification number for additional tamper evidence. These seals are generally used for industrial and commercial doors on trucks, trailers, and cargo containers that require tamper-evident seals while in storage, in transit, or if unattended during loading and offloading. Pack of 100 seals. Each seal is 3/8" wide x 8" long. Red plastic strap with black lettering. Numbered sequentially. Tamper evident 30 lb break strength. Enhanced double-click locking mechanism. Sourced from Uline, the leading distributor of professional shipping materials in North America. Recyclable anywhere #5 plastic can be recycled. 100% SATISFACTION GUARANTEE - If you are unhappy for any reason, you can use Amazon's normal 30-day return policy or you can contact the seller, UltiLife, and we will provide a full refund to your Amazon account under our 100% Satisfaction Guarantee. Never any hidden shipping or re-stocking fees! EXTRA PROTECTION: Double-click locking mechanism adds additional security. Ensures that the seal can not be popped open and resealed again. TAMPER EVIDENT: The polypropylene plastic material blushes to show evidence of tampering and the seals are each consecutively numbered with a unique identification number printed on them for additional tamper evidence. EASY TO USE: These numbered security seals easily separate from each other, easily snap into place, and are self-locking. All saving you time and effort. PRODUCT SPECIFICATIONS: Pack of 100 seals. Each truck seal is 3/8 wide x 8 long. Red plastic strap with black lettering. Numbered sequentially. Weather-resistant. Tamper evident 30 lb break strength. Enhanced double-click locking mechanism. Sourced from Uline, the leading distributor of professional shipping materials in North America. Made of #5 recyclable plastic. ULTIMATE GUARANTEE: If you are unhappy for any reason, you can use Amazon's normal 30-day return policy or you can contact the seller, UltiLife, and we will provide a full refund to your Amazon account under our 100% Satisfaction Guarantee. Never any hidden shipping or re-stocking fees! Specification: Total 5,000pcs. Tags are black in color. Designed for all fabrics. This barbs fasteners is the most common tag pin for standard tag gun, which is used for clothing tagging applications. Excellent Value: Compatible for standard tagging gun. Only use with standard tagging gun, not for use with fine tagging gun. 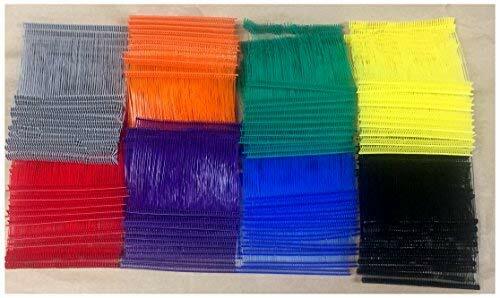 This is a lot of 4000 3" Standard Tagging Gun Barbs...you get 500 each of Black Red Blue Green Orange Purple Grey Yellow ...these work with all standard tagging guns. This rainbow of brilliant tag gun attaching fasteners will give you a myriad of options whether your pricing merchandise for retail display or using them for your favorite craft application. You can create subtle unique identification of product category for store shoppers that demonstrates your attention to detail and enhancing the customer experience. 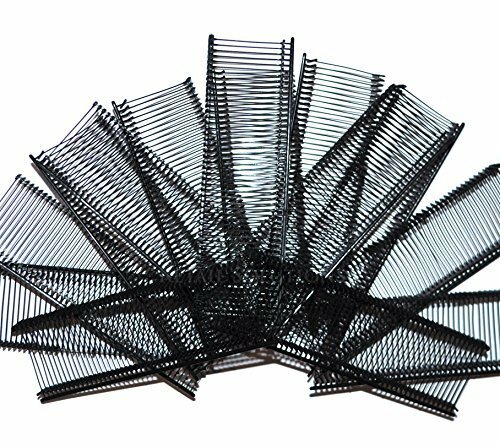 There are 3 different lengths including around 1 inch/ 2.5 cm, 2 inch/ 5 cm and 3 inch/ 7.5 cm, and 2000 pieces per size, which is enough for spare and replacement. This set of tag fasteners are for use in craft making, home decorating, or hanging the tags of different items such as clothes, jewelry, shoes, umbrella, bags, cases, cups, etc. These tag fasteners are compatible with many brands of standard tagging guns. Wide applications: this set of tag fasteners are for use in craft making, home decorating, or hanging the tags of different items such as clothes, jewelry, shoes, umbrella, bags, cases, cups, etc. 5000 pcs of premium quality 5 inch security loop tie fasteners allow for easy and secure and adjustable fastening of tags to products. Beaded tie allows for adjustable length to securely attached tags in place and a simple solution for low-risk tamper evidence sealing. 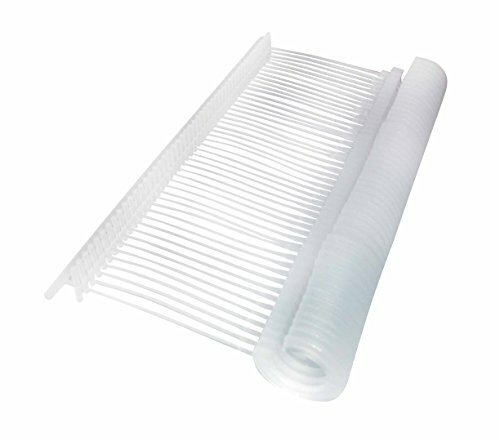 Ideal for many forms of bundling and attaching around the home and office. 5000 pcs in a convenient storage box. Amram tagging products are a leading choice for retailers and manufacturers. 5000 pcs of premium quality 5 inch security loop tie fasteners allow for easy and secure and adjustable fastening of tags to products. 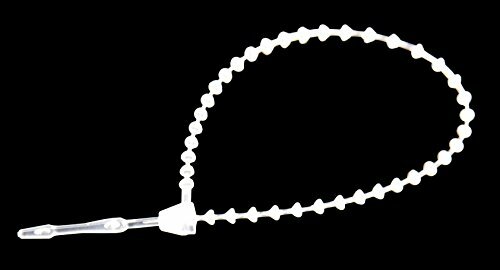 Beaded tie allows for adjustable length to securely attached tags in place and a simple solution for low-risk tamper evidence sealing. Ideal for many forms of bundling and attaching around the home and office. 5000 pcs in a convenient storage box. Amram tagging products are a leading choice for retailers and manufacturers. There are 4 different sizes including 6.3 cm (about 2.5 inch), 8 cm (about 3 inch), 13.4 cm (about 5 inch), 17.8 cm (about 7 inch), and 500 pieces each size, enough for spare and replacement. This set of tag fasteners can be widely applied for craft making, home decoration, or hanging the tags of different items such as clothes, jewelry, slipper, sports shoes, umbrella, bags, cases, cups, etc.. These plastic tag fasteners can be easily applied, and you don't need a tag gun; You can simply push them together by hands with ease. This set of tag fastener is not adjustable. Application: you can use this set of tag fasteners for craft making, home decoration, or hanging the tags of different items such as clothes, jewelry, slipper, sports shoes, umbrella, bags, cases, cups, etc. 5000 pcs of premium quality 1 Inch fine tagging fasteners for use with most fine tagging guns including Comfort Grip Fine and Hawk Fine tagging guns. Clean cut taper cuts attachments cleanly and evenly- greatly reducing jamming and hand and wrist stress. Amram fine tagging attachments secure price tags to merchandise. Designed for use with with delicate fabrics including lingerie and other fine fabrics. 5000 pcs in a convenient storage box. Not for use with Standard tagging or guns standard types of fabrics including wool, linen, cotton, light denim, polyester and synthetics. For best best results, use with Amram tag attaching tagging guns and Amram replacement needles. Amram tagging products are a leading choice for retailers and manufacturers. Amram fine tagging attachments secure price tags to merchandise. Designed for use with with delicate fabrics including lingerie and other fine fabrics. 5000 pcs in a convenient storage box. Not for use with Standard tagging or guns standard types of fabrics including wool, linen, cotton, light denim, polyester and synthetics. 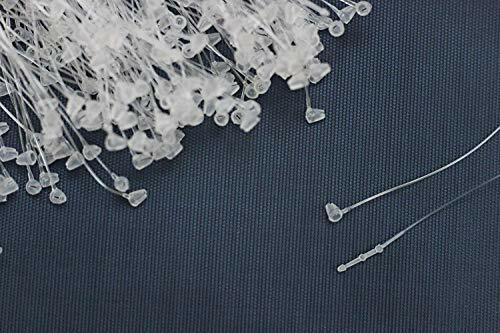 5000 pcs of premium quality 2 Inch J-Hook standard tagging fasteners for use with most standard tagging guns including Comfort Grip, Hawk and Amram standard tagging guns. Clean cut taper cuts attachments cleanly and evenly- greatly reducing jamming and hand and wrist stress. Amram standard tagging attachments secure price tags to merchandise. Designed for use with standard types of fabrics including wool, linen, cotton, light denim, polyester and synthetics. 5000 pcs in a convenient storage box. Not for use with Fine tagging guns. For best best results, use with Amram tag attaching tagging guns and Amram replacement needles. Amram tagging products are a leading choice for retailers and manufacturers. 5000 pcs of premium quality 2 Inch J-Hook standard tagging fasteners for use with most standard tagging guns including Comfort Grip, Hawk and Amram standard tagging guns. Clean cut taper cuts attachments cleanly and evenly- greatly reducing jamming and hand and wrist stress. Amram standard tagging attachments secure price tags to merchandise. Designed for use with standard types of fabrics including wool, linen, cotton, light denim, polyester and synthetics. 5000 pcs in a convenient storage box. Not for use with Fine tagging guns. 5000 pcs of premium quality 1 Inch fine tagging fasteners for use with most fine tagging guns including Comfort Grip Fine and Hawk Fine tagging guns. Clean cut taper cuts attachments cleanly and evenly- greatly reducing jamming and hand and wrist stress. Amram fine tagging attachments secure price tags to merchandise. Designed for use with with delicate fabrics including lingerie and other fine fabrics. 5000 pcs in a convenient storage box. Not for use with Standard tagging guns or standard types of fabrics including wool, linen, cotton, light denim, polyester and synthetics. For best best results, use with Amram tag attaching tagging guns and Amram replacement needles. Amram tagging products are a leading choice for retailers and manufacturers. 5000 pcs of premium quality 1 Inch fine tagging fasteners for use with most fine tagging guns including Comfort Grip Fine and Hawk Fine tagging guns. Clean cut taper cuts attachments cleanly and evenly- greatly reducing jamming and hand and wrist stress. 5000 pcs in a convenient storage box. Not for use with Standard tagging guns or standard types of fabrics including wool, linen, cotton, light denim, polyester and synthetics. Amram tagging products are a leading choice for retailers and manufacturers for close to 50 years. Be sure to view all of our Amazon ASINs for a complete listing of AMRAM tag attaching related products and more! 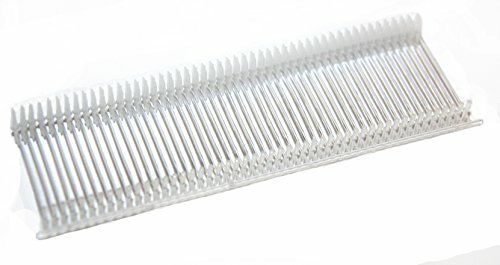 5000 Pieces 3 Plastic Tag Pin Fastener Snap Locks Security Loop. These tag fasteners pins are easy to use without tagging guns. They are suitable for various bundles and attachment forms around families and offices. Material: these tag fasteners are made of durable PP plastic. 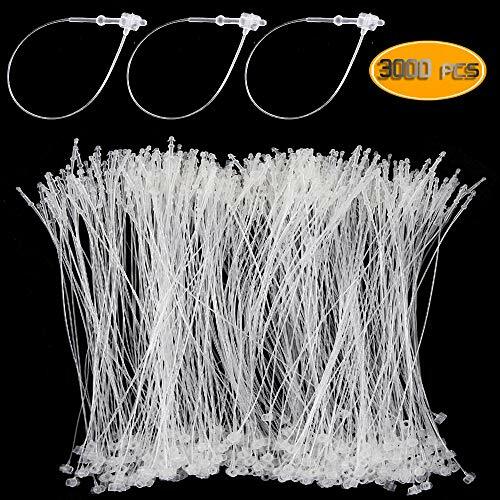 SIZE:5000 pieces 3 in PP plastic pins.1000 pieces per small bag.